B-Coder works extremely well with Microsoft Office applications, specifically Microsoft Word, but there may be an additional step required to paste the high quality barcode that B-Coder generates into your Word document. The default graphic format used by B-Coder is Windows MetaFile*. In all recent versions of Windows, Microsoft has added support for a new MetaFile format called "Enhanced MetaFile"**. Most Windows programs (including Word) fully support both the WMF and the EMF file formats. 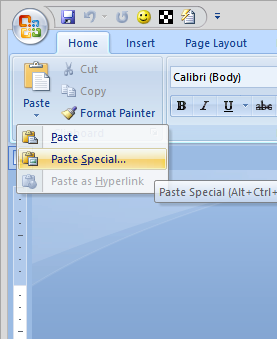 However Word, Excel and a few other applications automatically convert MetaFiles to Enhanced MetaFiles. When you paste barcodes from B-Coder into these programs by selecting "Paste" from their EDIT menu, the barcode will be automatically converted to an Enhanced MetaFile and subsequently may not print correctly. 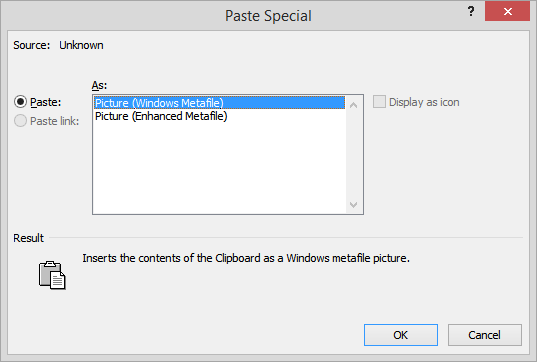 For these applications you must select "Paste Special" and in the "Paste Special" dialog box choose either "Picture" or "MetaFile" (instead of "Enhanced MetaFile") as the format. If you paste barcodes from B-Coder into Word using this technique, you will get perfect barcodes every time. If you are using Office 2010 or 2013 and are still having issues pasting barcodes, please click here and review our article discussing a fix. * B-Coder also supports many other graphic file formats. However, the standard MetaFile format is ideal for creating high quality barcode graphics. ** The new Enhanced MetaFile format has several major design flaws that render it inadequate for creating extremely high resolution graphics (as required when printing barcodes). Microsoft is purported to be working on a solution to the problems and it is expected that all will be corrected in the next release of Windows. Until the problems are rectified, B-Coder will not support the Enhanced MetaFile graphic format. As soon as they are, we will offer an update to B-Coder that fully supports Enhanced MetaFiles. Please note that Microsoft has made it clear that it has no intention of ever removing support for the standard MetaFile format therefore you can rest assured that any barcodes that you create today with B-Coder will always print perfectly with any future versions of Windows.